The Emperor Karl League of Prayer U.S.A. and Canada is pleased to announce the newly published official Gebetsliga Prayer Book. Edited by U.S.A. and Canadian Delegates Fr. Boniface Hicks, O.S.B., and Suzanne Pearson, this prayer book contains devotional resources of Blessed Karl of Austria including: a history of The Emperor Karl League of Prayer; a novena; devotional prayers; a short biography; important dates and quotes from his life; and liturgical texts for the celebration of Holy Mass and The Liturgy of the Hours on his October 21 Memorial. The new Gebetsliga Prayer Book was designed and typeset by U.S.A. and Canadian League Webmaster and Designer, Mr. Jordan Hainsey. Constructed to last a lifetime of prayerful use, this handsome prayer book features a rich, felted-cotton cover that is foil-embossed with the Gebestliga coat of arms. 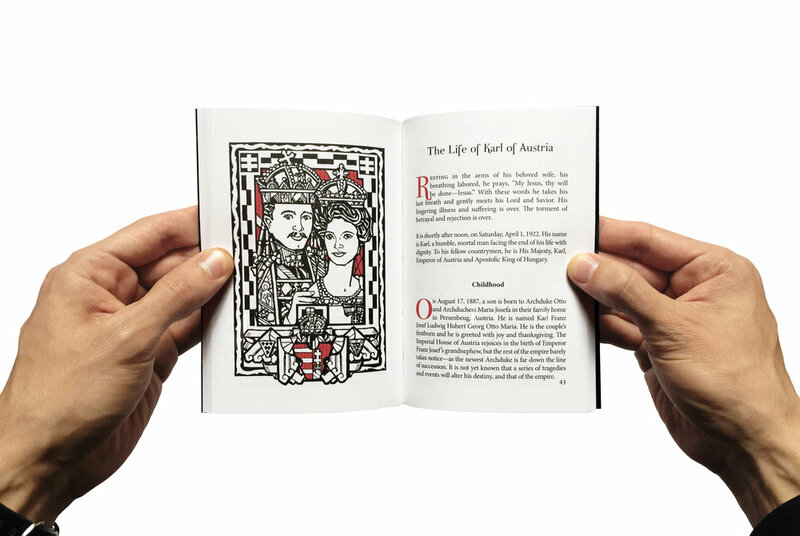 Six illustrations were commissioned by the League of Prayer U.S.A. and Canada from renowned liturgical illustrator and designer, Matthew Alderman. Numerous publications have featured his artwork including: Sacred Architecture, First Things, Antiphon: A Journal of Liturgical Renewal, and The Living Church. In 2010, he completed 15 full-page illustrations for Liturgy Training Publications' landmark altar edition of the Revised Roman Missal, and in 2011, he produced over 50 illustrations for HarperCollins UK's Sunday and Weekday Missals. The Gebetsliga Prayer Book illustrations are executed in black and red ink and compliment the text, serving as a catalyst for meditation and prayer. The Gebetsliga Prayer Book is the perfect companion for all members of The League of Prayer or those just learning about Blessed Karl for the first time. Printed and bound in the U.S.A., the prayer book carries the Imprimatur of Bishop Roger J. Foys, D.D., of the Diocese of Covington, and an accompanying Nihil Obstat. Paulus Publishes "The Holy King: The History of Blessed Karl of Austria"